Last weekend, we celebrated Purdue Commencement. My thanks to all the faculty and staff that participated in the ceremony and attended (another) terrific College of Agriculture graduation reception. A special thanks to Donya Lester and Debbie Jakes, who organized the reception. Summer commencement exercises have a bit different feel from those in May and December. During the August graduation, the majority of the ceremony is focused on awarding graduate degrees, especially Ph.D degrees. One of our Ph.D graduates was Udit Minocha in Food Science (major professor Dr. Bruce Applegate). Dr. Minocha was a member of the National Guard and was deployed twice during his degree program (Kosovo and Iraq). We also graduated another class of our distance-delivered MS-MBA program in food and agribusiness. Since its launch in 1999, the program has graduated some 176 students from across the U.S. and around the world. Graduate education is one of the core activities of our College. We currently have 601 graduate students enrolled in the College—331 Ph.D students and 270 MS students. About 62% are from the U.S. and 38% come from all over the world. Our graduates are exceptional individuals – leaders in academe, research, government, and industry. Some recent names in the news include Dr. Akin Adesina (MS 1985, Ph.D 1988, Agricultural Economics) who was recently named Minister of Agriculture in Nigeria. Dr. JoAnn Suzich (Ph.D 1983, Biochemistry), who received an honorary doctorate from our College in the spring, led the team that discovered the compound we now know as Gardisil, a human papillomavirus (HPV) vaccine. Patty Stroup, who received an MS-MBA in Food and Agribusiness in 2004, now leads Nestlé’s global dairy procurement enterprise from Switzerland. This list could go on and on. Our current graduate students are leaders on campus. Andy Robinson, a doctoral student in Botany and Plant Pathology, just completed his term as President of the Purdue Graduate Student Government, and Rebecca Logsdon, a doctoral student in Agricultural and Biological Engineering, is the current President. As a college, we are committed to an exceptional graduate program. In that spirit, over the coming year we will be moving the graduate program from its current home in the Office of Academic Programs (OAP) to the Agriculture Research Office (ARP). This will allow us to focus more closely on the graduate program since graduate education is intimately aligned with the College’s research agenda and funding for graduate students is similarly aligned with research funding. Associate Dean Karen Plaut and her staff will focus on enhancing graduate student mentoring and professional development. This also allows us to more closely link graduate student recruiting with our researchers and research agenda. In addition, the move will allow our new Associate Dean of Academic Programs, Marcos Fernandez, to focus on new undergraduate initiatives including a core curriculum, a new honors college, and increasing our efforts in retention and transfer students. We plan to take some time with this move and do it right—getting thoughtful input from faculty and students, and making sure nothing is forgotten. In the end, this move will make both OAP and ARP stronger and more focused units and much more in tune with the faculty and students they serve. Our College has a proud tradition of exceptional graduate education. With the changes we are making over the coming year, we look forward to an even more exciting future. P.S. : As we begin a new semester, I wish all of you a terrific fall. As we welcome some 3,000 Agriculture undergrads and graduate students, thanks for all that each of you do to help us deliver exceptional undergraduate and graduate academic programs. Growing demand for corn to use in biofuels and for soybeans to help feed a booming Chinese economy are among key forces driving commodity prices higher this year, according to a report by three Purdue agricultural economists: Drs. Phil Abbot, Chris Hurt and Wally Tyner. A weak U.S. dollar, high oil prices, declining grain supplies and poor harvests in 2010 also contributed, they wrote in the report, which predicts that high prices will continue beyond the 2011 crop year. They detailed their findings in "What's Driving Food Prices in 2011," commissioned by Farm Foundation, NFP, and released July 19. Costs of commodities influence retail food prices as do general inflationary pressures such as transportation, packaging and food processing. The report follows their analyses for Farm Foundation, NFP, in 2008 and 2009, when retail food prices also peaked. A new farm at Purdue is providing practical experience to students who are learning not only how to grow vegetables, but also how to manage a small business and conduct research. Because they run the farm themselves, their experience is bringing them "Full Circle" in agriculture, a reference to the group they formed to organize the operation. The students, advised by Dr. Steve Hallett, Botany and Plant Pathology, last fall began planning the 5-acre farm west of campus, located across from the Horticulture Park along state Route 26. They are now producing an array of vegetables that includes tomatoes, corn, beans, peppers, radishes, onions and salad greens in small plots to test production strategies. Dr. Bill Muir, Animal Sciences, is urging federal officials to decide whether genetically engineered salmon would be allowed for U.S. consumption and arguing that not doing so may set back scientific efforts to increase food production. Muir said that based on data made available by the U.S. Food and Drug Administration, AquAdvantage (AA) salmon poses little real risk to the environment or human health. AA salmon were given a gene from Chinook salmon that speeds growth and improves feed efficiency in farm-raised fish. Developed by AquaBounty Technologies, the fish would be spawned in Canada and grown to full size in Panama, both of which are land-based, contained facilities. For the second year in a row, an Indiana wine took home a major trophy at the 20th Indy International Wine Competition, which wrapped up over the weekend at Purdue University. Huber Orchard & Winery's 2010 Catawba Rosé was named best international rosé wine of the year. The winery was also awarded the Governor's Cup, given to the Indiana winery of the year. "Once again, the quality of Indiana wines stood out against thousands of entries from all over the world," said Christian Butzke, professor of enology and chief judge for the competition. "We had many truly spectacular wines this year, and the winners can be very proud of their exceptional winegrowing and winemaking skills." Indiana wines took home 223 medals, 54 of them golds and double golds. Pork prices are on the rise as international exports increase and high feed costs are passed on to consumers, says Dr. Chris Hurt, Agricultural Economics. Retail prices this year are averaging a record $3.35 per pound, up 14 percent from $2.93 per pound in early 2010. Increases in exports to South Korea, Japan, Russia and China have led to stronger demand for U.S. pork, he said. Meat designated for export comprised 22 percent of all U.S. pork in production this spring, and he said that is leaving less for U.S. consumers. "While it now appears pork production will rise about 1 percent this year, the large sales to foreign customers mean tight supplies here at home," Hurt said. Educational displays about bed bugs, grain bin safety and how veterinary medicine can advance human health are featured among Purdue University exhibits at the Indiana State Fair Aug. 5-21. They are among other activities, including analysis of the U.S. Department of Agriculture's August crop production report, Purdue Day and recognition of outstanding women in agriculture, which will involve Purdue Agriculture during the run of the fair. As Indiana soybeans move from flowering to beginning pod, farmers may consider applying foliar fungicides and insecticides to their crops. But according to research conducted by Dr. Kiersten Wise, Botany and Plant Pathology, yield increases from either treatment are inconsistent when disease and insect pressures aren't present. Many growers are interested in possible fungicide and insecticide applications for other benefits, which may include retention of green leaf area that leads to extended seed fill and, ultimately, higher yields. While the uncertainty on Wall Street directly affects the financial sector, Dr. Mike Boehlje, Agricultural Economics, says it's the indirect consequences coupled with weather concerns that has the agriculture industry on edge. Agriculture, with the exception of livestock, has been more resistant to recession, he says. Much of the demand for U.S. grain comes from the mandated use of ethanol and in exports, which have recovered more quickly in recent years than has domestic demand. Should the United States end up in a "double-dip" recession, Boehlje said, livestock producers could potentially face higher feed costs, reduced domestic demand and lower export demand. Lawn care providers should not use the herbicide Imprelis on residential and other properties such as golf courses as experts try to determine whether it is injuring trees and ornamental plants and can be used safely, a team led by Dr. Aaron Patton, Agronomy, advises. The team released a guide on July 22 for turfgrass professionals, and the Office of Indiana State Chemist distributed information to them on the process for investigations into complaints about injury to trees and shrubs. The herbicide is suspected of injuring mainly evergreens, including Norway spruce, Colorado blue spruce, arborvitae and eastern white pine. Symptoms of injury also have been noted on honeylocust and several other types of trees and ornamental plants. Eight new Agriculture faculty joined Dean Jay Akridge and Associate Deans Marcos Fernandez, Chuck Hibberd and Karent Plaut for the 2011 New Faculty Tour on August 10 and 11. Each year we take our newer faculty members on a tour of a region of Indiana to become more familiar with its food, agriculture and natural resource systems. It is a great opportunity for our new faculty to connect with some of our alumni and stakeholders around the state and learn about the breadth of Indiana agriculture and agribusiness. 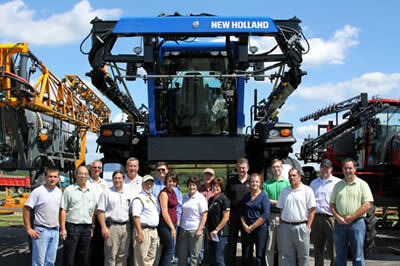 This year's tour covered Northeast Indiana, including a stop at the New Holland farm equipment dealership in Rochester, Indiana owned by Purdue Agriculture friend Jim Straeter, where the group posed with a giant crop sprayer. Just a couple of years ago, students now in Jenna Rickus' genomics class were anxiously awaiting college acceptance letters. Today, they're knee-deep -- literally in some cases -- in the genomes of bacteriophages, viruses that infect and live off bacteria. Their research will be available to scientists all over the world. Purdue is among a small group of institutions selected by the Howard Hughes Medical Institute's Science Education Alliance to offer the National Genomics Research Initiative, a two-semester course developed to give undergraduate students experiences in scientific discovery. The course was offered for the first time at Purdue during the 2010-11 academic year. Rural landowners can better understand how to run a successful business enterprise by attending one of two workshops sponsored by Purdue Extension and other organizations with expertise in natural resources. One workshop will be held Sept. 7 at Snider’s Maple Syrup in New Paris in Elkhart County; the other will be Sept. 8 at Piney Acres Farm in Hancock County’s Fortville. Participants will learn how to manage their land’s resources, market their enterprise and reduce their liability. There also will be information on insurance and zoning considerations and on different types of agritourism and other enterprises. Cale Bigelow, Agronomy, has been selected as a Fellow of the Purdue University Teaching Academy. The Teaching Academy at Purdue strives to bring together the best teaching faculty across campus to create a collective voice for teaching and learning on campus. Levon Esters, YDAE, received a North American Colleges and Teachers of Agriculture (NACTA) Teacher Fellow Award. The NACTA Teacher Fellow Award is a criterion based award and is reviewed by a committee of NACTA members. Criteria included in the evaluation are the instructor's teaching philosophy; evaluations submitted by current students, alumni, administrative officers, and peers; a self-evaluation as well as factors such as availability to students, teaching innovations, and departmental/institutional activity. Mike Hancock, Fertilizer Administrator for the Office of Indiana State Chemist received the D.S. Coltrane Award given by the Association of American Plant Food Control Officials (AAPFCO) at the Annual meeting of the Association in Austin, Texas. According to Dr. Bob Waltz, Indiana State Chemist, Mike has been recognized by many as a mentor in the AAAPFCO organization and a strong advocate for good practices whether in industry or in regulatory work. His career is characterized by the consistent incorporation of the best science available in a way that results in the maximized use of fertilizer products and technologies, and his efforts have created a regulatory environment for product use that is both economically and environmentally sound. Peter “Joel” Mercado-Reyes, an incoming Biochemistry major from Indianapolis, was featured as one of "5 Students Who Are New Boilermakers" this month. Peter participated in the Science Bound program, which works with students in the Indianapolis Public School system to encourage them to pursue science, technology, engineering and math careers. The Agricultural and Applied Economics Association (AAEA) honored three Purdue faculty at the annual meeting in Pittsburgh. Drs. Corinne Alexander, W. Scott Downey and Frank Dooley were honored for their outstanding programs in Extension and Teaching. David Widmar took second place in the Graduate Student Extension Competition that is sponsored by the Extension Section of the AAEA, also at the annual meetings in Pittsburgh. P. Christopher Earley, dean of the University of Connecticut School of Business, will be the new dean of Purdue University's Krannert School of Management. Earley has held his current position since January 2008. Prior to that, he was dean of the National University of Singapore Business School, chair of organizational behavior at London Business School in England, and Randall L. Tobias Chair of Global Leadership at Indiana University's Kelley School of Business. Dr. Earley will begin at Purdue during the fall semester. Purdue President France A. Córdova announced two new programs to aid more students with scholarships and attract top faculty with additional money for setting up research programs, hiring graduate students and equipping laboratories. Córdova has allocated $7 million for student scholarships that will be used to stimulate efforts to raise private donations for student support. Faculty recruitment efforts will get a $6 million boost to enhance start-up packages for research support. The programs were made possible by one-time gains realized this past fiscal year from university investments. Purdue University officials announced that Ted Malone from University of Alaska Anchorage will be the new director of the Division of Financial Aid. The appointment is effective Aug. 24. Joyce Hall, the previous director, will retire in August after 25 years at Purdue. Purdue staff and students make a major impact on the community where they live and are being urged to help make it an even better place. Greater Lafayette Commerce has formed a Community of Choice Committee that is charged with assessing the quality of life in the area and working to improve it. Part of that assessment is a survey measuring the community's appeal as a place to live, work and retire, according to Mike Piggott, co-chair of the Community of Choice Committee and Purdue's community relations director. Faculty researchers can now place orders for capacity in a new community cluster supercomputer ITaP plans to have operational in September. The Hansen cluster will feature Dell compute nodes with four 12-core AMD Opteron 6176 processors (48 cores per node) and either 96 or 192 gigabytes of memory. A large-memory option with 512 gigabytes also is available. To see available hardware and to order visit: http://www.rcac.purdue.edu/order/.